Acylic slatwall shelving in stock and ready to ship! These sturdy slatwall acrylic shelves are ideal for books, DVDs and CDs. The 5 in. lip at the edge helps keep your inventory in place. 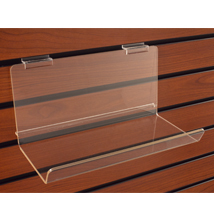 The clear design of this slatwall shelving ensures it will match your store`s decor. For additional pieces, we encourage you to spend some time to check out our full collection of slatwall shelving at Specialty Store Services now.